[About the man who had been healed, John wrote:] But afterward Jesus found him in the Temple and told him, "Now you are well; so stop sinning, or something even worse may happen to you." Then the man went and told the Jewish leaders that it was Jesus who had healed him. Stop sinning! Isn't it interesting that while all the fury and fuss were about Jesus' supposed sin on the Sabbath, the real sinner was the man who was healed. He didn't want to take responsibility for anything. He wouldn't go out on the limb to honor Jesus and follow him. Jesus warned him, and he ignored the warning. He went and immediately betrayed Jesus into the hands of those who would do him harm. When we become ashamed to share the testimony of what Jesus is doing in our lives, the sad reality is that we are easily conscripted to do holy-sounding things that actually do the Kingdom great harm. 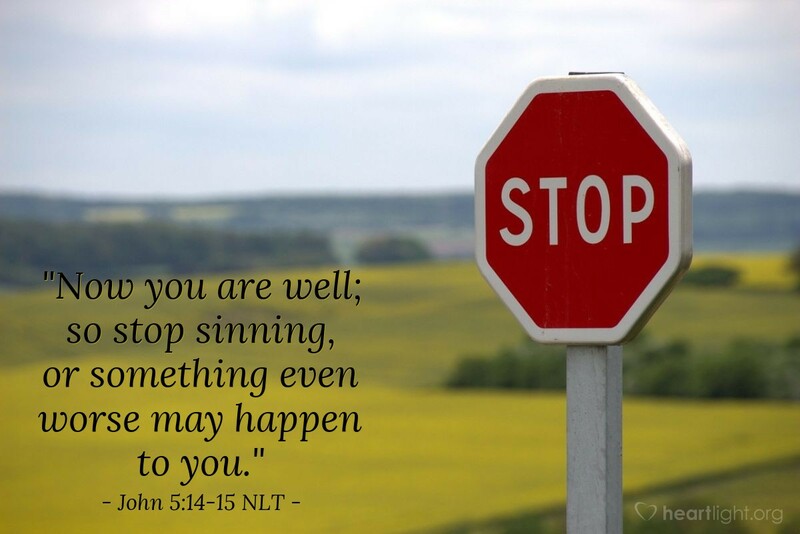 Jesus says to us, "stop sinning"! Let's heed his warning today. Father, stop me and confront me when I am being led astray, especially by things that sound religious, but which are really sin. Give me a clearer and more holy understanding of your will in my life and a more powerful and holy influence upon my friends. In Jesus' name. Amen.